ItemD-07695 - Depiction of Victoria. ItemD-06286 - "Klondikers homeward bound, aboard the SS Rosalie, Nov. 1899." ItemD-06287 - "Juneau whaling station"; SS Detroit at dock. ItemD-06297 - "Building the railroad through Broadway, Skaguay [sic], June 15, 1898." ItemD-06301 - "Cargo for scow Skookum loading at Dyea Harbour." ItemD-06304 - Seattle Hotel, Sheep Camp. ItemD-06307 - Mr. and Mrs. Edgar John Ridout, nee Ethel May Daley, with their three year old son, Arthur Daley Ridout. ItemD-06306 - Mr. and Mrs. Edgar John Ridout, nee Ethel May Daley, with their children, Flora Louise and Arthur Daley. ItemD-06316 - Mr. E. Rushton behind the wheel of a Peerless motorcar. 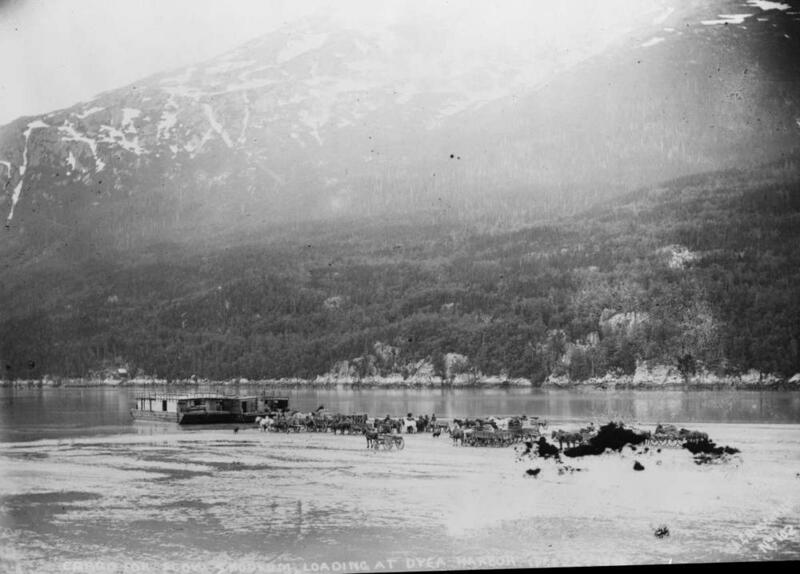 Item D-06301 - "Cargo for scow Skookum loading at Dyea Harbour."